August has never been to the doctor for an illness and has never been on an antibiotic. Very different story then my childhood, for sure. I mean ya, we’ve been there for her well-child checks, but that is it. Praise the Lord that she has been generally healthy with a minor cold here and there. On the rare occasion that a cold comes up (which almost always happens when we are out of town), I like to have some natural remedies to use first. Our go-to is elderberry syrup and essential oils. 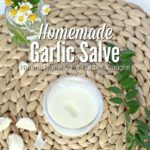 These things can really do wonders, but I wanted something to really nip her cold in the bud, so we added this homemade garlic salve to the mix recently. Let’s be honest here folks, dealing with a sick kid is never fun, and seriously… I just don’t want to catch it. Selfish parenting at it’s best, no less. Garlic is amazing for your health, and it helps boost your immune system. It has been shown to help decrease cold instances and decrease the length of a cold. Although we add garlic to just about everything around these parts, it can be hard to get your two year old to eat a couple cloves of garlic. 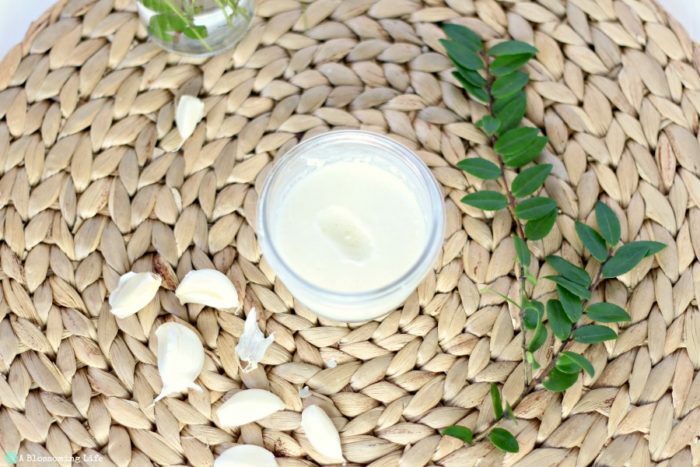 This salve helps this without having to ingest actual garlic. You just rub it on their feet and back or chest. 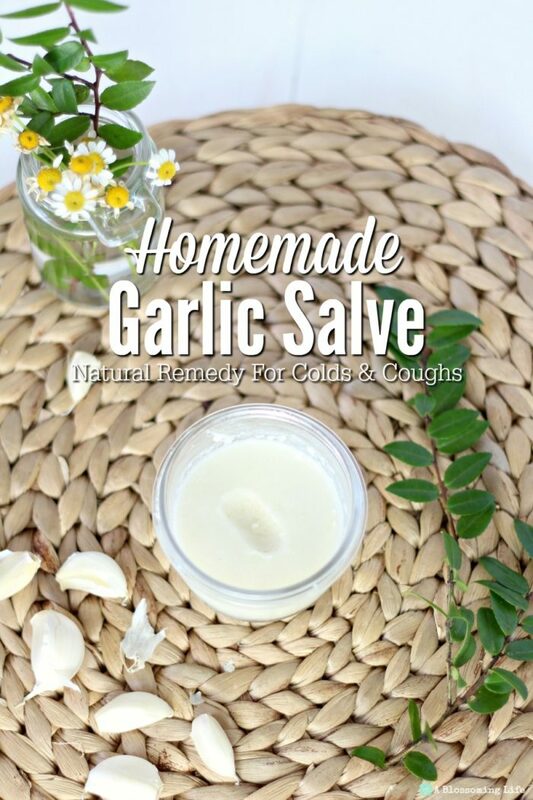 I’m not going to claim here that I came up with the idea for this garlic salve. My friend Ariel, who is a natural remedy wiz, told me about it. You should check out her shop – she has great stuff for really reasonable prices. So, I came up with my own recipe and added essential oils to create something I believe truly helps with colds and coughs. August’s running nose and cranky “sick kid” attitude was gone in about half a day with using this garlic salve, some Sniffle Stopper, and elderberry syrup. Pretty good. Fair warning though, you or your child will smell like a pickle, breadstick, Italian dressing or anything else you can think of with a heavy garlic smell. But what’s more pleasant? A pickle-smelling child or a sick, miserable kid? I choose the pickle. 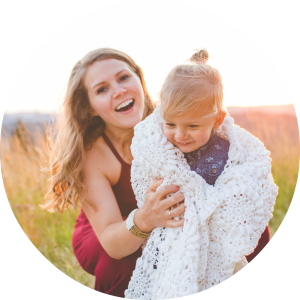 10-12 drops essential oil - I like using kid safe I like using kid safe Germ Destroyer (1% dilution for children under 2/pregnancy/or breastfeeding). For normal adults that are not pregnant or breastfeeding, a thieves-like blend (I use Germ Fighter) would also work well, or lavender for a calming effect. In a blender or food processor, add coconut oil (partially melted works best) and garlic cloves and blend until completely completely smooth - about 2-3 minutes. Pour into container and mix in essential oils. Cover and store in the fridge. To use: Every few hours, apply to back or chest and the bottoms of feet until symptoms resolve. I like to place socks on after applying to feet. Obviously, if symptoms do not improve, take your child to the doctor. Coconut oil hardens during refrigeration. 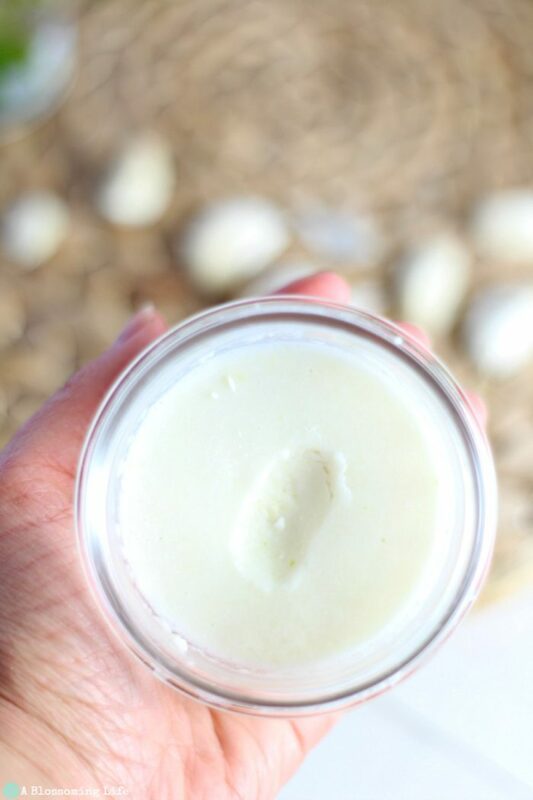 Just use a spoon to scrape out some of the salve when you are about to apply it. It will then melt in your hand. *A note about essential oil companies: I’m not here to sell you a specific brand of essential oils, nor am I on anyone’s team to sell essential oils. Many people have their preference on which essential oil company they like best. I personally love Plant Therapy essential oils because of their extremely strict quality control and great prices. I would also use Doterra, Young Living, and/or Rocky Mountain Oils (that’s Libby’s jam). We’ve had great success with Plant Therapy for my family, so that is what we stick with for now. I have a 4 month is it safe to use on him. Hey Janelle. Always consult a doctor before using anything on babies. And most places I have read suggest not using essential oils on babies until after 6 months.